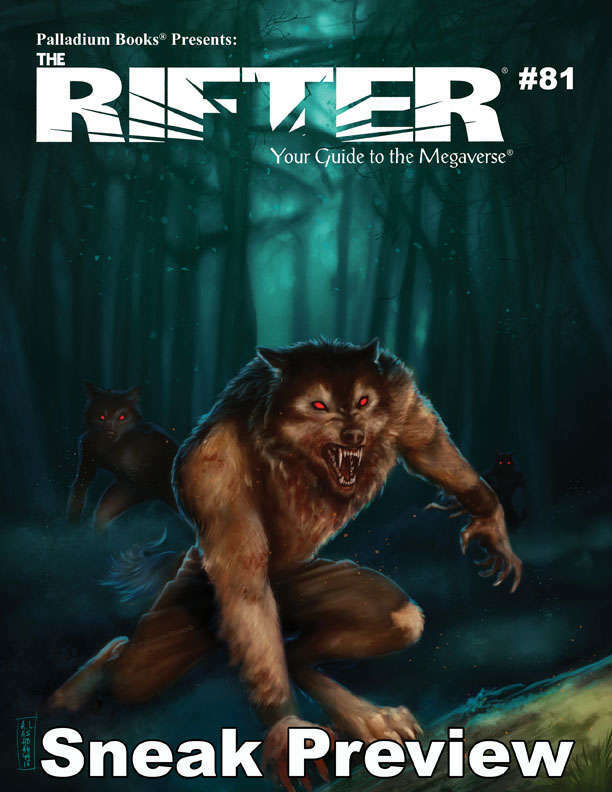 This is a sneak preview of The Rifter® #81. This sneak preview includes the front cover, credits, contents, From the Desk of Kevin Siembieda, Palladium News, Coming Attractions, an excerpt from Gnomes: Undersized and Underestimated for the Palladium Fantasy RPG®, an excerpt from Hitting the Streets with the Super Sleuth for Heroes Unlimited™, an excerpt from Blood Moon for the Palladium Fantasy RPG®, and an excerpt from Chaos Earth Nebraska, Part Two, for Rifts® Chaos Earth®. The Rifter® #81 will be available on July 31, 2018. For more information, please visit our website.